How rude! I never asked for the line to be changed - don't think anyone came close to suggesting any such thing. I was, in the post you quoted, merely responding to the suggestion that I had 'missed the point'. That's about my text, not yours, and I don't think it's unreasonable to respond. We were told that the bungee sequence from the original film was eschewed because it was more or less a product of its time when bungee jumping was still a popular sport. I have no problem with constructive criticism but nitpicking about certain trivial aspects of the report such as the comment about my choice of the word "antiquated" is a tad irritating. 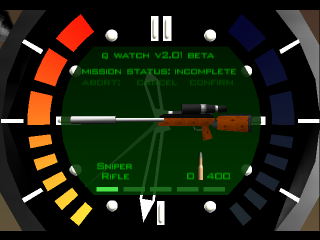 I wasn't calling wristwatches in general "antiquated," I was simply referring to Bond's watch in GoldenEye for N64. Look! It was sleek and modern looking back in 1997 but compared to Bond's smartphone in Activision's new game, it is antiquated. That's all I was trying to convey but since you were too busy scouring the report for "errors," you missed the point I was trying to make. Why am I comparing a wristwatch to a smartphone, you ask? Well, it's because both gadgets perform similar functions in their respective games therefore a comparison is warranted. This is explained in the report. So, how about Blood Stone? What ensues is a non-stop, wall-to-wall action sequence that follows Bond from air, to sea and finally, to land. Watching this video I couldn't shake the feeling of how flat and generic the whole thing felt. Graphically it seemed dated - though maybe that's just the web video, and the lighting and textures will be better by time of release - and the action seems a long way from the kind of immediate-feeling, unique style one gets from the best FPS games these days. Zero tension, too. Not sure we won't be getting the same, predictable enemy AI, either. Unless you were at this event or are employed by Activision, I highly doubt you've seen the demo footage we saw. the only thing that annoys me is we've scene more glimpses of the levels of Goldeneye then Bloodstone both the trailer and the demo and every picture I've seen is from the first level. I want to see what the other levels look like. So it's my fault for reading the piece wrong? There's no inference that the move to a new smartphone is better? Here's the thing: This game isn't a remake. So why would it use the existing graphics? The game's coming out in 2010, so why would it use the old graphics? It's allaying a concern that doesn't exist and implying that the new game is better, rather than merely newer. Given that the entire article is very clear on its endorsement of every decision taken, it's not surprising. Fine if you have that view - but I don't have to be reading it wrongly to take that inference away. No is it fair for me to suggest that perspective is in there without backing it up with examples. Still, if you think this is again flogging a dead horse, by all means debate the umpteen points I've made about the game rather than zeroing in on issues with the copy. Right to reply goes both ways and you're as welcome to leave point rest as I am. 2. Type in Blood Stone. 3. Click the first unsponsored video on the list. 4. Consider video recording and playback quality, and compare to the officially released trailer footage, before drawing opinion. 5. Clamber down off high-horse and appreciate that someone who disagrees with you doesn't have to be wrong *or* a liar. Edited by sorking, 30 July 2010 - 02:47 PM. I can't believe I only just read that report. Great stuff guys, both games sounds amazing. So the Bloodstone pre titles are actually longer that what was shown at the Activision press conference? Outstanding. Any idea on the run time of either of these games? Actually, sorking, in defense of Chris, we were privy to footage that I have yet been able to find anywhere online. Also, we were told that the graphic rendering from "Blood Stone" was not yet completed. So look for the final product to look considerably better than what we've already seen. Oh, I don't doubt. Only meant to suggest that I'd seen footage of the game in action - content that does seem, also, to have been shown at that event. Oh, I'm sure. That's why I said earlier that "maybe...lighting and textures will be better by time of release". Now, I doubt that'll be the case. That unfinished line is always one to give out in early promotion since it covers the makers against anything that doesn't look right - even stuff that's going to stay the same - but we'll see. What I don't expect is any great improvement in level design and enemy AI. Because, as of yet, we've no reason to think there's been any step up in these areas. The makers haven't said they've made any improvements in those areas, either. Does this means that we may have a game based on a past bold film ?? For such an event, an all Bonds option would make sense. But if I had to pick one Bond to play as, it'd be Timothy Dalton. The man has had something of a resurgence of late, and I'd like to see that capitalised on. He's recently done voice work for the Toy Story 3 game, so he's familiar with the scene. On Her Majesties Secret Service staring Daniel Craig as James Bond 007. It's bold innovative and if Goldeneye Sells well i wouldn't be surprised to see this film get adapted as game with Daniel Craig as 007. Wonder who would play Tracy Bond. They're never going to adapt On Her Majesty's Secret Service into a video game because it doesn't have commercial appeal. I'd love to see it made but we all need to remember that these games aren't made for diehard James Bond fans. They're made for a broad audience so that they can turn a profit. I know but it will seem like a brand new story with Daniel Craig rather then a remake of a 1969 film. like I said my predection take it for what you will. I have to agree - if the MGM situation isn't resolved by 2012, we may see another repeat of this year with a 'remake' and an 'original'. I think if they are to 'remake' one of the older movies, it would need to be one of the major films - one with an instantly recognisable name to the general populace, not just the 'we'. I'd hazard a guess at Doctor No - or, perhaps, at an outside chance, Goldfinger. I could imagine a Craig Era 'remake' of Doctor No being quite a fun game - as it lacks any true action sequences, there would be a lot of room for reimagining it WITH action set-pieces. I don't see the point. By going to so much trouble to make it different, why not just go the whole way and make it its own thing? Go the Blood Stone route instead. We could have an entire library of original Craig video game adventures. Sort of like a new novel coming out every year. I can't escape the fact it's Lazenby's film. If they followed the movie closer and set it in 1969, I would be more for it. I wouldn't mind having things like the unused rooftop scene included. But I have no desire to see an updated, "improved" OHMSS with a David Arnold score thrown in. You cannot improve upon perfection. But anyway, like Righty, I can't see them going anywhere near it. It's too polarising. Players dont care who is james bond , they care about the gameplay and the story . Good game with many features and multiplayer will let this OHMSS game sell well .. True but i believe in the contract Activision signed and agreed to they could only use the current 007's likeness and I think voice.